Learn about Lake Arrowhead by reading Spend a Memorable Vacation in the Mountains-Lake Arrowhead, California by Sandy Zimmerman, Travel Writer. It features a mini, but thorough tour of the destination, plus all you'll need to know to plan your trip including getting there, objective information on places to stay and eat, and things to do. At the end of the article, we've provided a summary of the contact information for your easy reference. Enjoy! Imagine, a sparkling lake, clear blue skies, with nature all around you- the ultimate year round getaway! It’s California’s popular four-season mountain resort at Lake Arrowhead. Spreading through 9,215 acres in the San Bernardino National Forest, Lake Arrowhead rises 5,106 feet with 14 miles of shoreline. The locals feel very strongly about the beauty of the mountains, Marty Ingels and Shirley Jones even bought a piece of property to save it from developers. To really see the beauty of nature and the mountains, hike or take a jeep/ATV along the forest service roads for hundreds of miles of breathtaking panoramas through canyons, ridges, and meadows. Visit historic mines from California’s gold rush days, follow a meandering river, or see wildlife along the trail. This is where the rich and famous play! Lake Gregory Regional Park has a public beach with lifeguards, 300-foot waterslides, picnic area, year-round fishing, trails, horseshoes, volleyball, conference center, restaurant, along with rowboat, pedal boat, aqua cycle, and paddle board rentals. Green Valley Lake offers fishing, swimming with lifeguards, picnic area, playground, and boat rentals. Hiking trails range from 3,000 feet to over 7,000 feet, moderate to difficult. Maps are available. Mountain biking is permitted on all OHV and hiking trails except the Pacific Crest Trail, Heap’s Peak Arboretum, and the Children’s Forest. Off highway vehicles can follow designated routes. See maps at Arrowhead Ranger station. Spark arrestors and green stickers are mandatory. Choose from picnic, skateboarding, skiing and snow play areas, cross-country skiing, family and group campgrounds, skating, star watching- Astronomical Society, water-skiing, horseback riding, fly-fishing, and other activities. The central focus of the area is the strikingly beautiful Tudor-style Lake Arrowhead Village, dramatically built right on the water. The center houses unique shops, art galleries, and restaurants with entertainment on weekends from spring through fall. Seniors, singles, and everybody else would enjoy Arrowhead’s proximity to around 16 small villages and communities, which offer social clubs, nightlife, and various activities. The Annual Home Tour weekend begins Friday night under the stars- you enjoy food, beverages, and entertainment. Then join the Saturday home tour from 9 A. M. - 5 P. M., visit 4 magnificent homes, then attend a wine and cheese reception at Burnt Mill Beach Club. Dances and club meetings are bountiful - Twin Peaks Senior Center, Crest Forest Seniors, Dancing Bears Square Dance Club, Leisure Shores Clubhouse and Senior Center, Mountain Top Hiking Club. See the local tourist papers for dates and times of events. Discover the lake, feel the thrills of exploring, or try a water adventure! During the Arrowhead Queen’s Boat Tour Captain Bill Smith points out some of the larger homes (11,000- 22,000 square feet), movie star’s homes, and the historical Whiskey Flats. He traces the beginning of Lake Arrowhead when the bootleggers and illegal casinos flourished along the lake. There’s something about the mountain air that gives you a big appetite! 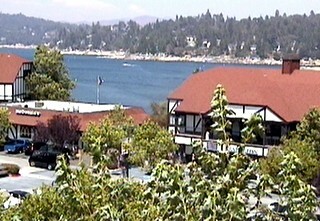 Barkley’s Restaurant, inside Lake Arrowhead Resort, serves breakfast, lunch, and dinner. The spirit of the old west is back at the Chef’s Inn and Tavern. Built in the 1800’s, this 3-story building was a popular logger hangout. They drank at the bar, dined in the parlor, and visited the upstairs boudoir. Adding to the pleasures of your dining, antiques dot the entrance, walls and every room of the building. Their stained glass windows and entry door originally decorated the old state capitol building in Carson City. The three 450 pound porcelain lion heads once adorned the old Pacific Trail ways Building. The restaurant aptly deserves their 4 star rating. Continental and American are their specialties. Chateau Gourmet is where food is a matter of good taste. Certified executive chef Shelton Lynn Segrest offers American, French, and Italian gourmet dining at reasonable prices. Segrest feels “our top priority is to excite your taste buds and show you that our meals come with unique flavors and top quality ingredients.” Winner of several awards, his experience guarantees that you will have a meal to remember! View Restaurant, inside the Storybook Inn, will satisfy even the most discriminating gourmet. Sit on the glassed terrace for a 100-mile view of Catalina, the mountains, or the night the lights of San Bernardino. A favorite among the locals on the mountain, Patty Teachout calls their dinners, recognizable meals, recipes with a twist. She explains “we serve big portions so our guests get their money’s worth and don’t go away hungry.” They are also open for breakfast and Sunday brunch. The Giant Oaks Lodge has a motel, cabins, and private meeting rooms. Lake Arrowhead Resort offers mountain and lake views, a beach, tennis courts, whirlpools, a recreational program during the summer, conference facilities, and a business center. The Snow Valley Mountain Resort is a ski resort. Instead of the regular cookie cutter-style hotel, try a friendly bed and breakfast inn for a change! Usually you rent a room in someone’s home and are allowed to enjoy the house as though it were your own. Each of the bed and breakfast inns is as unique as the personality of the owner. Their special furnishings, home cooked breakfast, and creatively decorated guest rooms add the perfect atmosphere for your vacation. Perched on the rim of a mountain, the Storybook Inn transports you to an enchanting setting with each room decorated as a scene from a storybook. Choose the Arabian Nights suite, Captain’s Quarters, King and I suite, Robin Hood, Goldilocks and the Three Bears family rooms, Key Largo, Tom Sawyer, Swiss Family, or Secret Garden suite. It is the added touches, which make their rooms a work of art. Each room has ultra comfy down feather beds, phones, TV’s, VCR’s, and private bath. Some rooms have Jacuzzis, fireplaces, and solariums. Owners Richard and Patty Teachout want to give their guests fun things to do. You will see antiques hanging from the ceiling, along the walls, and on almost every piece of furniture in the house and guest rooms. Richard is an expert antique collector and loves to have everyone guess the use of some of his most unusual pieces. Anyone guessing all 12 objects wins a free dinner. Richard’s most expensive antique is a student of Rembrandt’s painting hanging over the fireplace. His oldest is a 16th century blanket chest. See a patchwork quilt (1850) made of tobacco pouches, old English tin wash tubs used as night stands, Thomas Edison Gramophone cylindrical disc, a wedding cup designed to drink from both sides, and more! Relax in the living room, choose from over 100 free videos and games, play bocce ball/ archery, backgammon, cards, chess, checkers, Jenga, Monopoly, Parcheesi, and other games, or just lie on the hammock. They also have facilities for weddings, rehearsal dinners, receptions, parties, clubs, and groups. From Las Vegas take I-15 south to 138 east connect with 18 east. From Los Angeles take 110 North to 210 east connect with 18 east. 30 minutes from San Bernardino, 1- hour from Los Angeles, 4 hours from Las Vegas. Lake Gregory Regional Park, 24171 Lake Drive, Crestline. 8 miles from Lake Arrowhead, 909-338-2233. Green Valley Lake, 8 miles from Lake Arrowhead, 909-867-2009. Contact the Arrowhead Ranger Station, 909-382-2782 for the following activities: hiking, fly-fishing, off highway vehicles. Mountain biking, book rentals, 909-336-3732. Picnic areas- Baylis Park, Crest Park, and Switzer Park located on Hwy. 18. Skateboarding- The Lot, 20,000 square foot skate park, at Snow Valley ski area, 800-680-7669. Skiing and snow play areas, Snow Valley ski and snow boarding area, 5 miles east of Running Springs, 800-680-7669. Cross-country skiing - Rim Nordic ski area, 909-867-2600. Star watching- Astronomical Society, 909-336-1699. Water-skiing, at Lake Arrowhead, McKenzie Water Ski School, 909-337-3814. Family and group campgrounds. Reservations: Arrowhead Ranger Station, 909-382-2782, 877-444-6777. Summer Festival at Santa’s Village, Hwy. 18. Adults-$12. Students- 13-18, $10. Children 12 and under-free. From July 24-September 4, 6:30 P.M., Saturday nights, 909-337-5338. The Annual Home Tour weekend begins Friday night under the stars, and continues to Saturday- $25 for the weekend. September, 909-337-3715. Georgio's Lounge, inside Lake Arrowhead Resort offers Jazz, 909-744-3000. Senior Center in Twin Peaks. Dancing Bears Square Dance Club, 909-585-1467.
Leisure Shores Clubhouse and Senior Center, Crestline, 909-338-5036. Arrowhead Queen’s boat tour. Adults-$12, Seniors-$10, children from 3-11, $7.50. 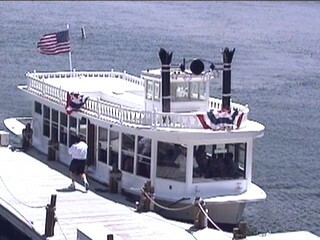 Every hour on the hour, at the Arrowhead Village waterfront, 50 minute narrated tour. Group rates and private parties, 909-336-6992. Lake Arrowhead Child’s Museum, Classes- quilting, cookie decorating, crafts. 909-336-3093. Wild Haven Ranch- tours, environmental programs, wildlife sanctuary, amphitheater, volunteer program, 909-337-1391. Barkley’s Restaurant, inside the Lake Arrowhead Resort, Restaurant: 7 A.M. -11 P.M., Salmon-$16.95, chicken-$9.95, chicken & shrimp-$17.95, NY steak-$19.95, halibut- $18.95. Lake Arrowhead, near the village, 909-336-1511. View Restaurant, inside the Storybook Inn. The lamb shank ($19) and braised beef short ribs ($18) are slow cooked for 12-15 hours. Each falls apart, and is tender and juicy. Entrees: wild salmon filet ($16), chicken stuffed with Portobello mushrooms and Brie ($16), pork chops with Maui onions ($18), shrimp scampi over linguini ($18), etc. The appetizers are original mariners - steaming fondue with lobster, crab, scallops and shrimp ($10) served in a fondue pot. The brie is warm with fresh apple slices and water table crackers ($8). The bruschetta ($8) is topped with artichokes and peppers for a tantalizing taste. Dinners come with soup or salad, wild rice or red potatoes, vegetables, and sourdough bread. Dessert choices are apple pie, cheesecake, and brownie. Dinner is served Friday and Saturday evenings from 5:30-8:30 P.M., with Sunday champagne brunch from 10:00 A.M. -2:30 P.M. ($12.95). Brunch features 6 to 8 entrees along with breakfast selections. Located in Sky forest, 5 minutes from Lake Arrowhead, 877-337-0011. Giant Oaks Lodge, minutes from Snow Valley Mountain Sports Park and Lake Arrowhead in Running Springs, 909-867-2231, http://www.runningsprings.com/. 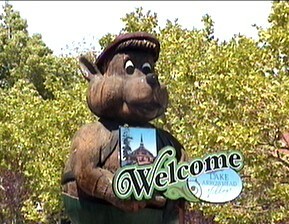 Lake Arrowhead Resort, summer rates - $149-209, winter rates -$129-179 suites - $325-450. Lake Arrowhead, 909-336-1511. Snow Valley Mountain Resort, Highway 18, and 5 miles east of Running Springs, http://www.snow-valley.com/. Storybook Inn- Robin Hood-$99, Goldilocks-$99 (adjoins family room), 3 bears-$109, Key Largo-$99, King & I suite-$129-169, Tom Sawyer-$149-189, Swiss Family- $149-189, Secret Garden suite-$139-179, Arabian Nights suite-$129-169, Captain’s Quarters-$89, Valley View Villa-$299, (1,000 square feet, 2 bedrooms, living room, bathroom with Jacuzzi tub, kitchenette, dining area, and wood stove ), Hobbit-$119-159, (living room, bedroom, kitchenette). Pet friendly rooms. Breakfast and one free glass of wine or beer are included with the rooms each day. Breakfast is an event, an all you can eat buffet: 2-3 entrees, baked goods, fresh juices, fruit, cereal, and yogurt. In Sky forest, 5 minutes from Lake Arrowhead, 877-337-0011. The Lake Arrowhead Community Chamber of Commerce, 800-337-3716. Crestline Chamber of Commerce, 909-338-2706. Lake Arrowhead Communities Chamber of Commerce & J. Putnam Henck Visitor Center, 909-337-3715. San Bernardino Mountains Community Hospital District, Lake Arrowhead, 29101 Hospital Road, 24 hours, daily, 909-336-3651. Lake Arrowhead Village Pharmacy, Monday-Friday, 9 A.M. -5:30 P.M., Saturday-9A.M. -5 P.M., 28200 State Hwy. #189, Suite 03-170, Lake Arrowhead, 909-336-0120.